Flying Scotsman Commemorative Cover. USA. 1969. Flying Scotsman USA Tour 1969 commemorative envelope. 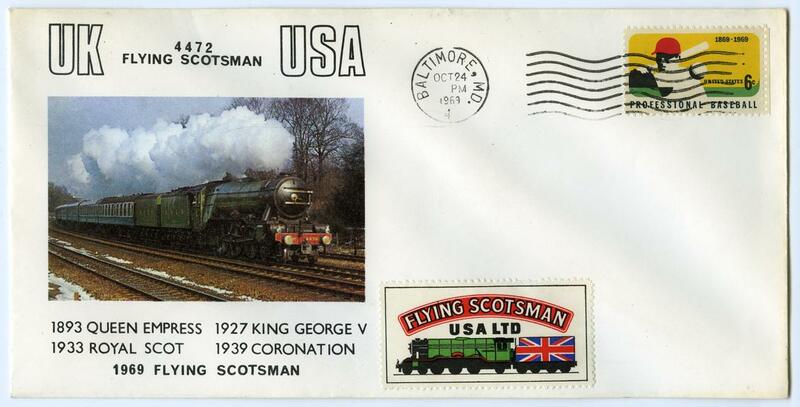 Envelope is marked "UK 4472 Flying Scotsman USA" and carries an illustration of Flying Scotsman and a list of British locomotives that had visited the USA. A stamp marked "Flying Scotsman USA Ltd." with a drawing of Flying Scotsman with a Union Jack tender has been affixed, as has a US 6 cent stamp. Postmarked Baltimore, Maryland, 24 October 1969.